St. Paul, Minn., December 16, 2015 PolyMet Mining Corp. TSX: POM; NYSE MKT: PLM today reported that it has filed its financial results for the three and nine months ended October 31, 2015. PolyMet controls 100 percent of the development-stage NorthMet copper-nickel-precious metals ore-body and the nearby Erie Plant, located near Hoyt Lakes in the established mining district of the Mesabi Iron Range in northeastern Minnesota. On November 6, 2015, the Minnesota Department of Natural Resources reported that the NorthMet Final Environmental Impact Statement had been completed. The Final EIS was subsequently posted in the Federal Register and the Minnesota Environmental Quality Board Monitor.Completion of the Final EIS is the culmination of more than a decade of detailed analysis and thorough review from various state and federal regulatory agencies. The Final EIS indicates that the proposed Project meets human health and environmental standards. The public can comment on the adequacy of the Final EIS until December 21, 2015. On November 16, 2015, the U.S. Forest Service published its Draft Record of Decision recommending the proposed land exchange in which PolyMet would receive surface rights in exchange for transferring land it currently owns to the Superior National Forest. The Draft ROD recognizes that the proposed land exchange would be beneficial to the National Forest and would be in the public interest. On December 15, 2015, Glencore AG, a wholly owned subsidiary of Glencore plc, agreed to extend the term of $66.145 million of outstanding secured convertible and non-convertible debentures to March 31, 2017, repayable at any time if it is prudent to do so. With effect from January 1, 2016, the interest rate will be 12-month US$ LIBOR plus 15%. Subject to stock exchange approval, convertibility was extended to March 31, 2017 (at the same conversion price of $1.2920 per share) and the expiration date of Glencores warrants to acquire 6,458,001 shares of PolyMet was extended to December 31, 2017 and the purchase price was reduced to $0.8231 per share. Loss for the three months ended October 31, 2015 was $1.661 million compared with $1.619 million for the prior year period. General and administrative expenses excluding non-cash stock-based compensation for the three months ended October 31, 2015 was $1.022 million compared with $0.997 million for the prior year period. Loss for the nine months ended October 31, 2015 was $6.917 million compared with $5.013 million for the prior year period. 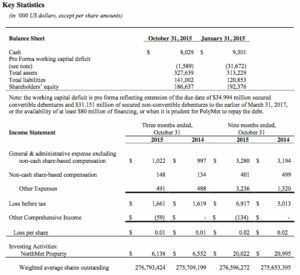 General and administrative expenses excluding non-cash stock-based compensation for the nine months ended October 31, 2015 were $3.280 million compared with $3.194 million for the prior year period. 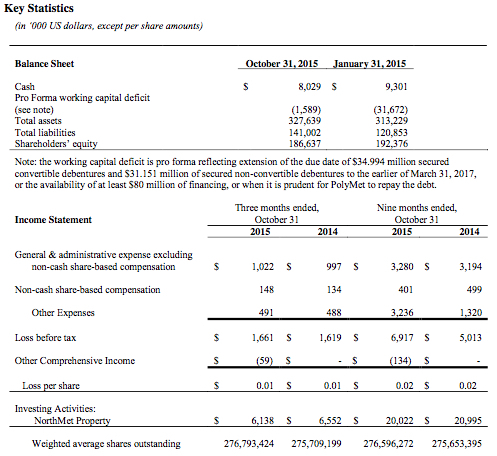 At October 31, 2015, PolyMet had cash of $8.029 million compared with $9.301 million at January 31, 2015. With the term of the loans from Glencore extended, PolyMet’s short term debt totals $4.874 million due to the Iron Range Resources & Rehabilitation Board, secured by land that forms part of the proposed land exchange with the USFS. PolyMet invested $6.138 million of cash into its NorthMet Project during the three months ended October 31, 2015, compared with $6.552 million in the prior year period, and invested $20.022 million into the Project in the nine months ended October 31, 2015, compared with $20.995 million in the prior year period. As of October 31, 2015, PolyMet had spent $98.4 million on environmental review and permitting, of which $92.0 million has been spent since the NorthMet Project moved from exploration to development stage. Construction finance including commitment of debt prior to the issuance of permits, subject to typical conditions precedent such as receipt of permits. Prior to receipt of permits, the Company will seek to secure construction financing that would be available upon receipt of key permits, with construction and ramp-up to commercial production anticipated to take approximately two years. The Company is currently in discussions with commercial banks and other financial institutions regarding construction finance. positioned to capture value at every stage of the supply chain, from sourcing materials deep underground to delivering products to an international customer base. Glencore plcs industrial and marketing activities are supported by a global network of more than 90 offices located in over 50 countries. Glencore plc’s diversified operations comprise over 150 mining and metallurgical sites, offshore oil production assets, farms and agricultural facilities. Glencore plc currently employs approximately 181,000 people. Glencore currently holds 78,724,821 common shares of PolyMet, representing approximately 28.4% of PolyMet’s issued and outstanding common shares.